Hi I’m Sarah Breitbarth, co-owner of Pins and Needles Alterations. My first memory of sewing was with my Grandma Pralle, I was about 9 years old and the project was a cross stitch picture stamped on turquoise fabric. I guess that’s when I fell in love with a needle. Since then, I have made countless items, first under the watchful eye of my Mother and then in 4-H and Home Ec. I had been sewing for pleasure for many years when the farming economy “blessed” me with the opportunity to go out into the world and try it as an occupation. In 1998, I went to work for Kayc Kline Alterations. In Spring of 2000 she offered to sell it to my current business partner Judy Marben and I. It was an offer we couldn’t refuse and in May of 2000, Pins and Needles Alterations was opened for business. 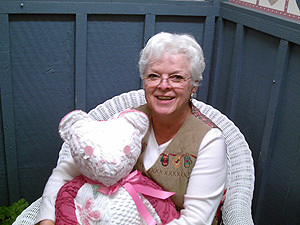 Since, Judy and I have enjoyed this opportunity to be of service to others, in clothing construction, repair and alteration and also in our other loves, such as making rag rugs on our loom and our current delightful project - Memory Bears. 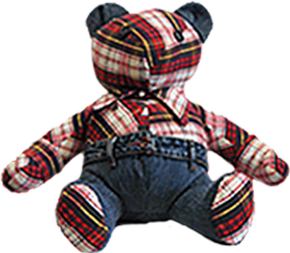 It is such a wonderful blessing to be able to preserve people’s memories of a loved one or favorite time in a huggable keepsake that can be passed on to many generations. I am looking forward to making many new friends in this avenue of our business. Can’t wait to hear from you! Give us a call! I'm Judy Marben. Seems like I've always loved to sew! Mom gave me print feed sacks at 9 or 10 to experiment with, making doll clothes or something for myself. Even before that, I played with paper dolls and regular dolls. As soon as I could use real material my dolls had lots more clothes. My first paid custom sewing job was at age 15. Through 4-H, home economics and a post-grad Needle Arts program, my skills and ideas were fine-tuned by many teachers. My first regular job was with a large furrier in Minneapolis, where I also learned about alterations in their ready-to-wear department. After moving to Mankato, I also worked for a furrier and helped establish their ladies' ready-to-wear department with alterations. Sewing and alterations from home seemed to be the solution for part time work while I was raising my 3 children. The flexibility and opportunities to experiment with new methods for alterations still are being used in our business today. When I went back to the regular work force for a major corporation, it didn't take too many years to discover it wasn't for me. I'm too independent! About that time, a dear friend needed help in her alteration business. I jumped at the chance to work with her in the mid 90's. My co-worker, Sarah Breitbarth and I bought the business in 2000, Changing the name to Pins and Needles Alterations. We have a wonderful friendship and work great together. Hobby sewing and quilting have also filled my spare time. That's where I found bears. A friend was making bears for gifts; soon I was also. Vintage chenille was my fabric of choice, so the collecting of that was on. I still enjoy making some bears from chenille. Now the creativity is channeled to the Memory Bears! 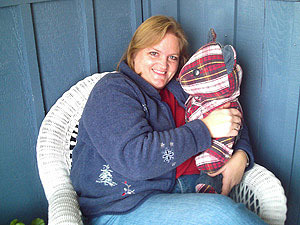 I love to see each person's fabrics, clothing and stories transformed into a memory bear. Now even with six grandchildren I haven't lost my enthusiasm for working at something I love doing anyway. Making the bears look good in their clothes and gaining my customers respect and friendship just make my days complete!